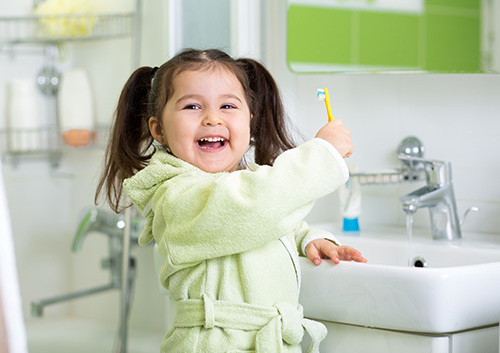 At SmileKidz, we know that brushing your toddler’s teeth can be an intimidating prospect. So we’re providing a few tips in the hope of making the process a lot more easy, effective, and all-around enjoyable for everyone! Start by getting into a position that gives you control and enables you to see well into your child’s mouth. If you can see clearly, you will be able to maneuver the toothbrush better around your son or daughter’s mouth for a better quality of brushing. It’s important to choose a time when your toddler is calm. Have your little one sit with his or her favorite stuffed animal, or play a fun movie in the background so your child can focus on something comforting while you’re brushing. Using a circular motion, brush all sides of their teeth. Be sure to let your toddler have a turn after you’re done, to start getting used to it. This way, he or she is more likely to repeat the brushing and flossing exercise when your youngster is old enough. Dr. Varble, Dr. Applebaum, Dr. Dill and Dr. Wong and our team agree that brushing and flossing need to be performed with kindness and care. To ensure your child learns good dental hygiene habits early on, be gentle and make this time a happy, learning time. Your child should also have regular appointments at our Creve Coeur, MO and St. Charles, MO office for checkups and cleanings to keep on track!